It’s true confession time: I don’t like to do what everyone else is doing. I’m of the mindset that I prefer to not be with the crowd, and that’s both good and bad about myself. It’s a tendency that often serves me well in terms of Magic finance, because if I’m thinking about things that others aren’t, then there’s the potential for adding value. This weekend, everyone is going to be agog about Eternal Masters landing and what will happen to those prices. My predictions from the last couple weeks feel okay, and at first blush there might be more of this printed than expected, so prices will be more likely to be low. So what am I thinking about? The two other blocks, Dragons of Tarkir/Magic Origins and Battle for Zendikar/Oath of the Gatewatch. 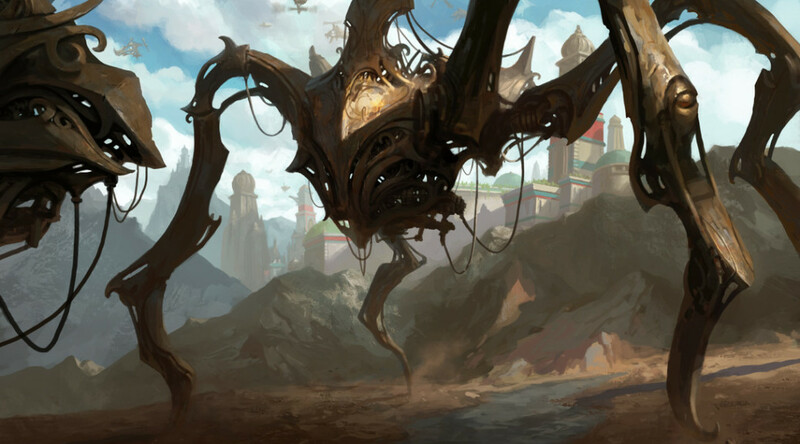 The former is going to rotate in about four months, when Kaladesh comes out, and the latter still has a year of legality left in Standard. Today I want to cover the rotating sets, and next week I’ll give you my ideas on the still-legal ones. A lot of Modern decks that used to use Birthing Pod have seemed to migrate over to this, and since it can hit any of the cards for the Melira infinite life combo, it’s a natural fit. The decks that play this almost never have less than a full playset, but there’s a lot of playsets out there. Don’t forget that this was in the Magic Origins Clash Pack, which also had a Dromoka’s Command and a Windswept Heath. I have a suspicion that this loses a couple of dollars around the time of rotation but not much, and it’s so good in Modern that it’ll start growing before you know it. This is a card that Modern was made for. This plus Snapcaster makes Grixis a real and powerful deck choice, especially as a maindeck answer to Spellskite and other artifacts. It’s relatively cheap and very flexible, and it’s nearly impossible not to get two cards’ worth of value out of it. I’ve already made good money on this card, but what I can’t get past is that this is already all over Modern and Legacy, and barely there in Standard. I think that this Command is going to stay stable through rotation and stays that way for some time. Picking them up won’t get you insane value now, but it will be stable and safe. There’s a lot of flavors of burn decks in Legacy and Modern. Most of them are no longer straight red, since adding white and/or green gives you extra angles of attack and better sideboard tools. This card can really pile the damage on in builds with multiple creatures, and again, this is a card already seeing a lot more play in non-rotating formats. I think that this starts trending upward very soon, but it’ll plateau because Naya isn’t the default deck. The $5 planeswalker rule applies here. This also shows how prohibitive a mana cost can be from format to format, because Jund players were all over Broodmate Dragon, yet Sarkhan, who can make two tokens, saw zero love. I love picking these up now and just waiting. The growth won’t ever be sudden, but it will be there. This is an expensive speculation target, but hear me out. It’s a mythic lord for Zombies, one of the top tribes for people to play casually. It’s also got built-in recursion, something that everyone enjoys. It’s $4 now out of pure casual appeal, and that is a flashing light signaling long-term growth to me. I am not as high on the foils, but those are likely to be at least stable going forward. This is another card that I’ve predicted would spike and made money from, and it’s almost back to those previous levels. It’s pure gold in casual settings, one of the best cards you could have in a Commander deck that likes casting red/multicolored spells. I think this is going to fall down a few dollars, and that’s when I’m going to jump in on them and just wait. Again. Oh how the mighty have fallen. It’s very hard for this card to not get value just by existing, though the presence of Path to Exile keeps it from taking over Modern. This was in the Event Deck, and that’s an extra few copies, but it’s a fantastic card in Affinity, and thatmight be enough to have it keep value. I’m sad to say it’s not done falling, but I do feel it’s good enough to still see play, and that will buoy and maintain the price. There’s no getting around it: This is seeing no Standard play, and this price is purely doe to casual appeal. As with the Executioner, I want to listen to what the trends are telling me.In this case, they are saying for me to spend $20 or $40 on spare copies, put them in bulk, and just wait. I disagree about Risen Executioner. It spiked prior to the release of Shadows over Innistrad since it is a zombie lord. This was caused by the usual speculation with cards that somehow fit into a new set’s theme (in this case zombie lord/zombies/Innistrad). The card doesn’t see any play though and the price is still falling. It’s not a $4 card because of casual appeal, it’s a $4 card because the price didn’t adjust yet after the speculator/hype spike. I’m sure it will fall quite a bit more before casual appeal will drive it up again. If it goes back down to ~$2 (which is where it was before the Innistrad hype) I could imagine buying some, but not before. I disagree about Hangarback. It’s entirely a standard card; it hasn’t broken into Affinity because it offers literally nothing that the deck wants besides being an artifact: it’s a slow, midrangey value card, while Affinity is a fast, linear aggro deck. I’d be shocked if it doesn’t drop to the $2 range after rotation, and stays there. Ben T and Cliff: Hangarback is played in Vintage, so foils will likely retain value. I’ve seen it cut from Modern affinity lists because it’s too slow. It will not to $2 Ben, but I don’t see it as a good investment either Cliff. Also Cliff, I think your projection for CoCo is too LOW. I usually never say that about a card, but your Sept 2017 price prediction of $25 is super low imo. I think it’ll be around $40 unless it gets banned and there’s no reason it should. It did have extra printings but Dragons was severely UNDERPRINTED in terms of Modern day cards. I’be been riding the CoCo train since it was spoiled, getting out at highs and buying back in at lows, if it falls to $15 on rotation I’ll buy every one I can get. I do like foils of CoCo as a better spec. The card is super fun and extremely good. I don’t know about long term, but I think Risen Executioner is actually a good pick right now before Eldritch Moon. I believe zombies will get some love in that set and are only a couple cards from making a good standard deck. It’s already good with Relentless Dead helping to bring it back from the graveyard without the limitations on Risen Executioner itself. I could see a spike on this card if zombies becomes standard viable.